Note: this is a slightly-updated and reformatted version of a post that was original published in September of 2008. I am both lazy enough to not re-write it yet shameless enough to re-post it in order to take advantage of the buzz surrounding the release of the Green Lantern film. 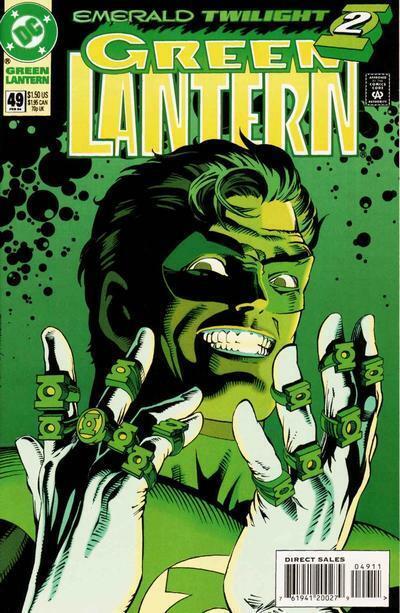 Hal possesses a ring which enables him to will into existence green physical constructs of anything he can imagine, including shields, cages and giant baseball gloves; the ring also enables Hal to fly, survive in space for extended periods of time, travel great distances, and understand alien languages. Hal is also an accomplished and fearless test pilot and a detective of moderate skill. The color yellow and blows to the head. A Green Lantern Corps (GLC) ring and accompanying Green Lantern power battery. 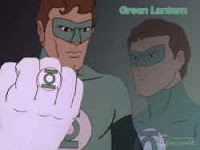 The ability to wield the Green Lantern ring is powered by the strength of the bearer's will; the ring itself must also be recharged periodically by placing it in a Green Lantern that's remotely connected to the GLC's central power battery. Fear in the ring bearer will create an inability for the ring to affect anything colored yellow. John Stewart, Guy Gardner, Kyle Rayner (fellow members of the Green Lantern Corps from Earth), Green Arrow (Oliver Queen, his best friend), the Flash (Barry Allen, his other best friend), Carol Ferris (his one-time boss and "Lois Lane", and occasional Star Sapphire), Pieface (Tom Kalmaku, his politically-incorrect Silver Age Inuit sidekick), the Guardians of the Universe (diminutive founders of the GLC), the Green Lantern Corps, the Justice League. Hal Jordan frequently appeared on the various Super Friends incarnations, in which he once moved the planet to prevent a missile from hitting it, amongst other things. The Green Lantern most modern viewers are more familiar with from the recent Justice League cartoon is John Stewart. 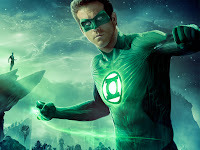 And of course, Mrs. Teebore favorite Ryan Reynolds is playing Hal in the just-released feature film. When Air Force test pilot Hal Jordan comes across the crashed ship and dying form of Green Lantern Abin Sur, he is chosen due to his ability to overcome great fear to replace Sur as the Green Lantern responsible for the safe keeping of Earth and the surrounding sector of space. "Emerald Twilight", Green Lantern (vol. III) 48-50 (Jan.-Mar. 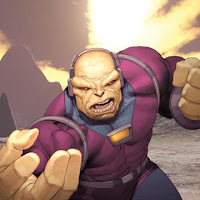 1994): After failing to prevent the uttter destruction of his hometown, Coast City, at the hands of Mongul, Hal goes insane with grief, allowing the fear entity Parallax to take control of him, leading Hal to slaughter all the existing Green Lanterns and Guardians in an effort to use their power rings to restore Coast City to life. 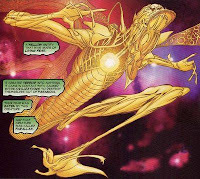 In the wake of the recent Sinestro Corps War storyline, each color in the spectrum received its own emotionally-powered Lantern. In addition to the willpower-fueled Green Lanterns and the fear-inducing yellow lanterns of the Sinestro Corps, there are (or will be) the rage-filled Red Lanterns, as well as Orange (avarice), Indigo (compassion), Violet (love), Blue (hope) and Black (death) lanterns. The original Green Lantern (Alan Scott) created in 40s, was a solo hero with the powers he gained from the Green Lantern being mystically-based. When DC kicked off the Silver Age in the late 50s by reimagining their existing characters with more sci-fi trappings, the mystically-powered vigilante Green Lantern became a space cop with a ring created by alien technology. 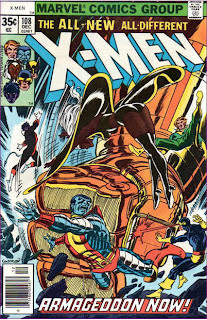 And thus was created one of my favorite comic book concepts of all time. 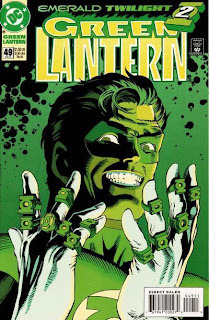 Because I like the concept of Green Lantern far more than any one particular character, I've always been a bit mystified by the rabid fanbase Hal Jordan has, particularly because the character in and of himself isn't all that interesting. But when Hal was replaced by Kyle during a time when the trend in superhero comics was to replace existing, seemingly old-fashioned characters with younger, hipper and often (but not in Kyle's case) darker versions of the characters, Hal's fanbase cried foul. The most vociferous of these fans formed a group called H.E.A.T (Hal's Emerald Attack Team) and loudly (and in some cases, profanely) urged DC to bring back the "one, true Green Lantern." Ron Marz, the writer of the issues which saw Hal transform into Parallax and kill his peers in the Corps felt a lot of heat as well (pun intended), depsite the fact that he was more or less merely brought onto the title to execute the editorially-mandated storyline. In time, DC began to slowly rehabilitate Hal, presumably in response to fan outcry. After a stint of time spent as the villainous Parallax, Hal sacrificed himself to save the planet, and was later made the host of the Spectre, DC's Spirit of Vengeance. But the fans wanted Hal back as Green Lantern, not the Spectre, and eventually, fan-turned-comic writer-turned-DC Grand Poobah Geoff Johns made Hal a Green Lantern once again, retconning the events of "Emerald Twilight" so that Hal didn't become Parallax but was possessed by Parallax due to his emotionally weakened state, and thus wasn't entirely responsible for his actions (Johns also managed to make the Silver Age-required yellow vulnerability kind of cool and came up with an explanation for the stylin' salt-n-pepper temples Hal was sporting before becoming Parallax). the black power is death? That's pretty cliche and lame. Couldn't they think of something better, and, like, actually an emotion? And what the hell is up with that panel with the yellow bat and robin? will you be seeing GL in theaters? "I've always been a bit mystified by the rabid fanbase Hal Jordan has..."
I mentioned in one of the DC restructuring posts that I didn't read a lot of DC comics as a kid. But somehow, I had an issue of Green Lantern/Green Arrow (though it was published before my time), and although I don't think I could read yet when I had it, I loved looking at the pictures. Add to that the Super Friends cartoon, and that's probably why I've always considered myself a Hal Jordan fan. He was my first exposure to the GL concept, though I have nothing against any of the others, but Hal just is the Green lantern to me. Plus, Hal Jordan is just a really cool "secret identity name". It just occurred to me that Green is made up of Blue and Yellow. So, really, Red should have been the Green Lantern's weakness. Also, you could have posted a To Better Know A Hero with one of the other Green Lanterns. Also, I too want to know what's up with that Batman panel. Also, Matt, it's OK to be a fan of Hal Jordan, but were you one of those fans enraged when he moved on and was no longer the Green Lantern and demanding that Hal Jordan become the Green Lantern again? @Sarah: the black power is death? That's pretty cliche and lame. Couldn't they think of something better, and, like, actually an emotion? It's actually not as bad as it sounds (I'm about halfway through "Blackest Night", which is the big "Black Lanterns attack!" story, at the moment). Basically, it was an excuse to do a "raise the dead" story where deceased heroes and villains come back to fight the heroes. Oddly enough, despite reading him in JLA and even his own comic for awhile, I have no strong attraction to him. I've always liked the character, but never loved him. That's a panel from All Star Batman and Robin aka ASBAR ("All Star" being DC's quasi-attempt at mimicking Marvel's "Ultimate" line, which succeeded wonderfully with All Star Superman but failed miserably with ASBAR). Written by Frank Miller with Jim Lee art, it was basically "what if Batman was a truly psychopathic nutjob" and is famous for giving us the line, "I'm the GODDAMNED Batman!" The jury is still out as to how much the unintentional humor was intentional, but pretty much anyone who read it and enjoyed (like me) did so because it was batshit crazy, not because it was very good. The project basically fell apart when DC lost interest in the All Star line and Miller and Lee's combined chronic lateness more or less killed the book. ANYWAY, that particular panel comes from an issue in which Batman and Robin need to question Green Lantern, and because he's the Goddamn Batman, he doesn't trust those authoritarian types int he Justice League, so he paints a room and everything in it, including himself and Robin, yellow so that Green Lantern won't be able to do anything. Which is pretty damned hilarious. Yes, though probably not 'til next week as Mrs. Teebore is out of town this weekend and would kill me if I saw her boy before she did. That said, GL is the superhero movie of the summer about which I'm the most dubious. Parts of it look awesome, other parts dreadfully lame. Indeed, and his whole "test pilot" secret identity is just classic Silver Age (I adore New Frontier and its melding of superheroes with the cultural zeitgeist of 50/60s). @Dr. Bitz: So, really, Red should have been the Green Lantern's weakness. 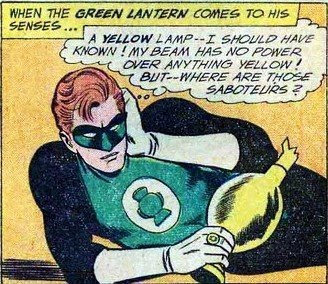 I'm fairly certain the time it took you to type that sentence was longer than the time spent deciding which color to make Green Lantern's weakness back in the day. I direct you to the second sentence of the post, specifically the section referring to my laziness. first i agree with Sarah that Death is not an emotion. @Anne: Death is not an emotion. To be fair, I don't think anyone involved with the project was trying to suggest it was. i don't want to associate myself with the crazies that are Hal fans. That was my feeling for awhile too, but I have a greater affection for the character since he came back. He pretty much just punches GL in the throat at one point, crushing it, and Batman freaks out at him, saying they were just trying to scare GL, not cripple him, and Robin's all like, "what do you want? I'm just following your example." this Batman comic just gets more and more hilarious!